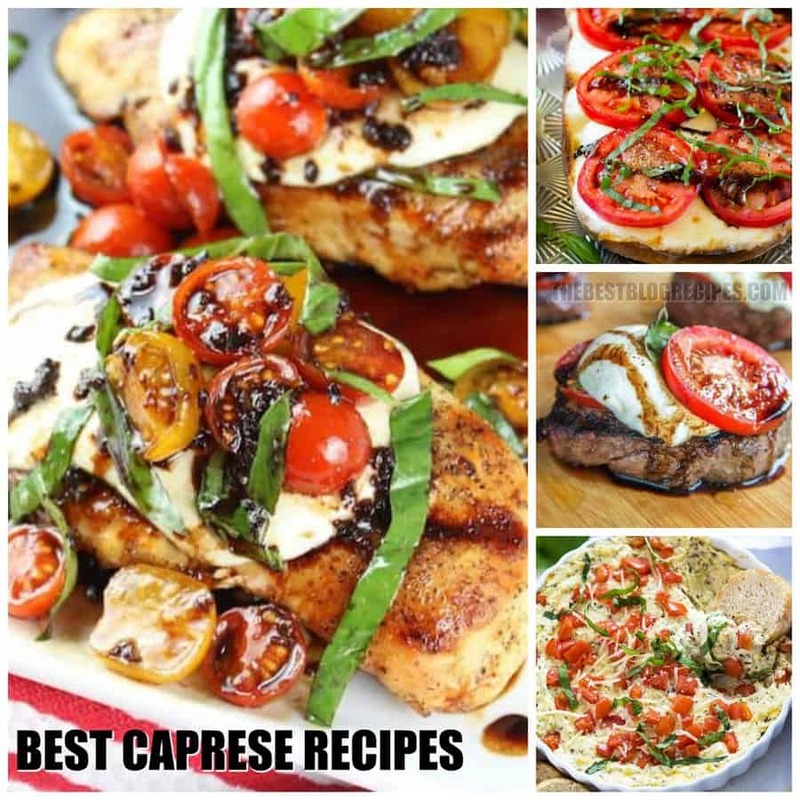 The Best Caprese Recipes are some of the tastiest recipes you will ever try. 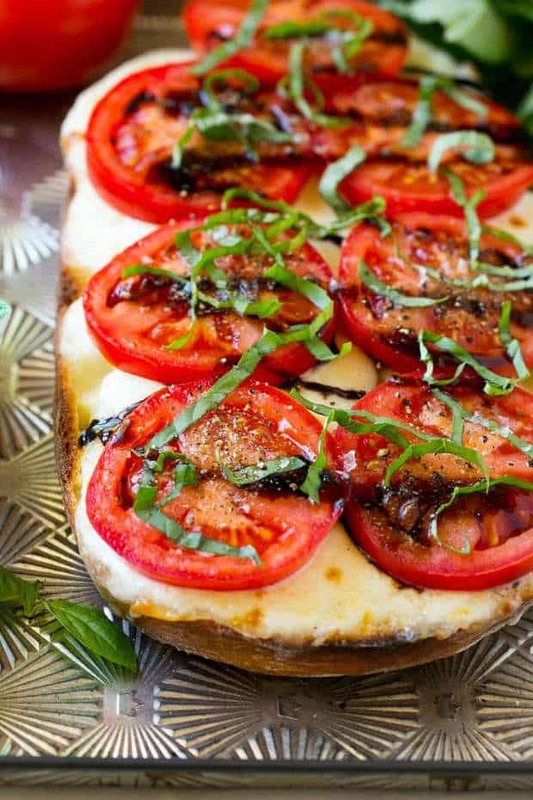 The combination of tomato, mozzarella, basil and balsamic will hit the spot every time! . Get ready to have some new favorite recipes. I love caprese recipes. Whenever I go to a restaurant, I always look to see if there is something caprese on the menu. If there is, I will get it every time without fail! Until this week, I thought caprese recipes were impossible to make without proper culinary training. I don’t know why — it’s probably because the work “caprese” sounds so fancy! 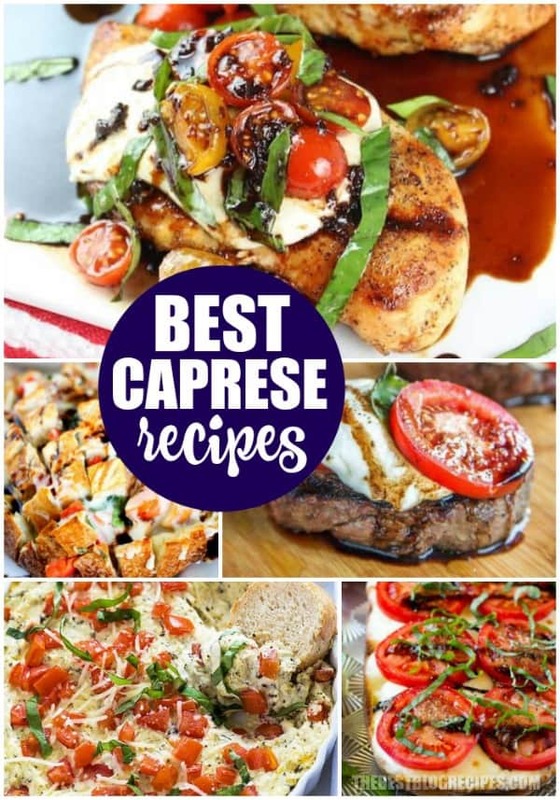 As I was rounding up the Best Caprese Recipes for you all, I discovered these recipes aren’t hard at all! Anyone can make the Best Caprese Recipes! Caprese recipes are seriously so delicious. The combination of flavors tastes so amazing no matter what kind of recipe it is. There are caprese recipes for dinner, snacks, side dishes, lunch, and so much more! To say I am excited to share the Best Caprese Recipes with you is an understatement. I think that the recipes in this list are to die for and I am sure that you will feel the same way! The best possible time to serve these recipes is when you’re with friends and family! Throw a nice dinner party for all of the adults in your life, crock open some wine (or sparkling apple cider) and take the night to relax! These recipes are so easy, but they’ll taste like you slaved over them for hours. Take any of these side dishes or salads to a potluck or even your next work party. They are sure to be a huge hit! So, without further ado, here are the Best Caprese Recipes! 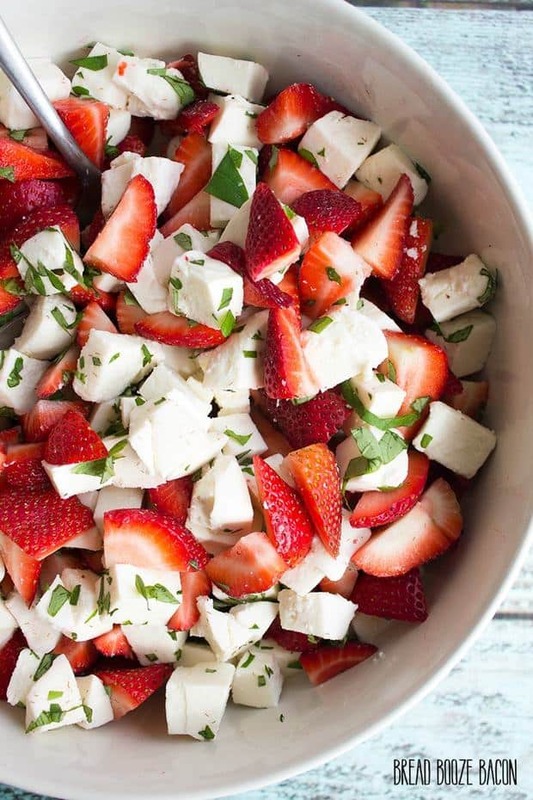 From Bread Booze Bacon :: Click HERE for the RECIPE This Strawberry Caprese Salad will make you forget all about tomatoes! 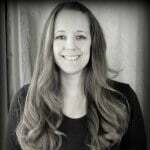 From The Recipe Critic :: Click HERE for the RECIPE Chicken Caprese Macaroni and Cheese. 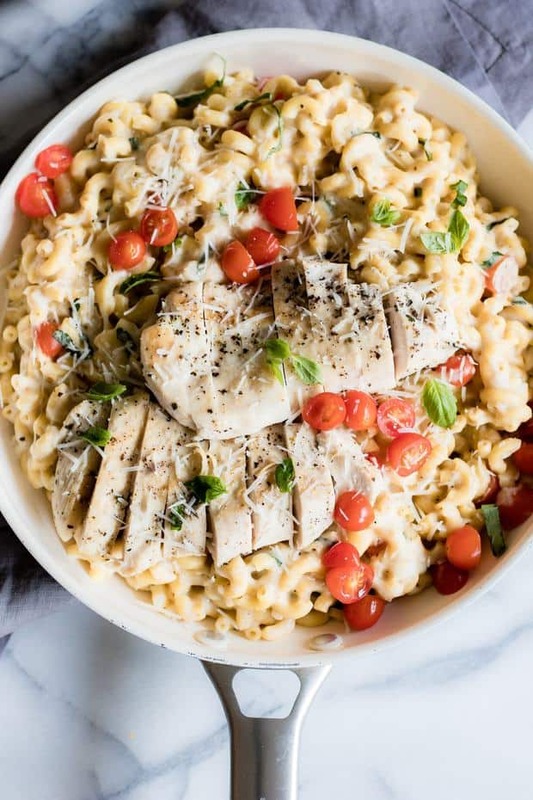 A quick and easy one pot meal loaded with juicy chicken, cheesy pasta and fresh tomatoes and basil. 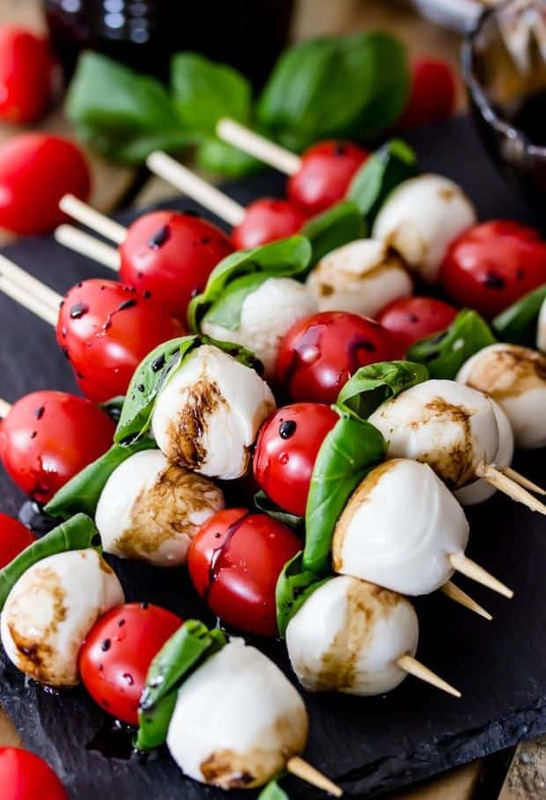 From The Recipe Critic :: Click HERE for the RECIPE Caprese Skewers are 4 ingredient appetizers that are so simple to make but guaranteed to impress! Made with cherry tomatoes, mozzarella, fresh basil, and an easy balsamic reduction, they imitate the classic Caprese salad, only made portable on a skewer! 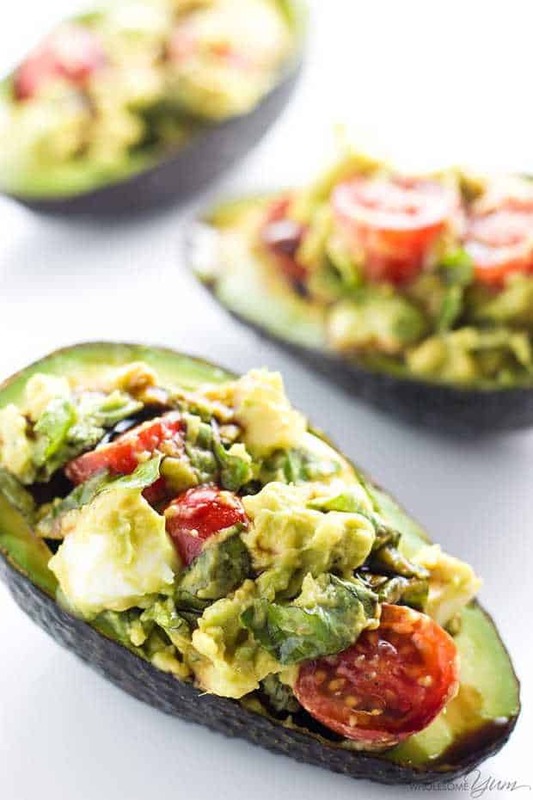 From The Wholesome Yum :: Click HERE for the RECIPE This easy Caprese stuffed avocado recipe is healthy & delicious! It’s so simple to make with common ingredients you probably have right now. 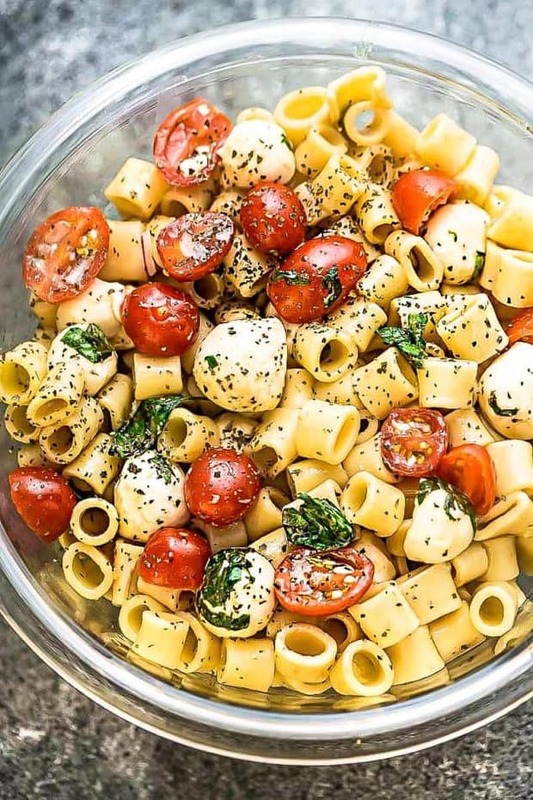 From Life Made Sweeter :: Click HERE for the RECIPE Caprese Pasta Salad – the perfect refreshing side dish for summer barbecues, potlucks, picnics and parties. Best of all, it’s easy to make with the classic caprese flavors and a homemade balsamic dressing. 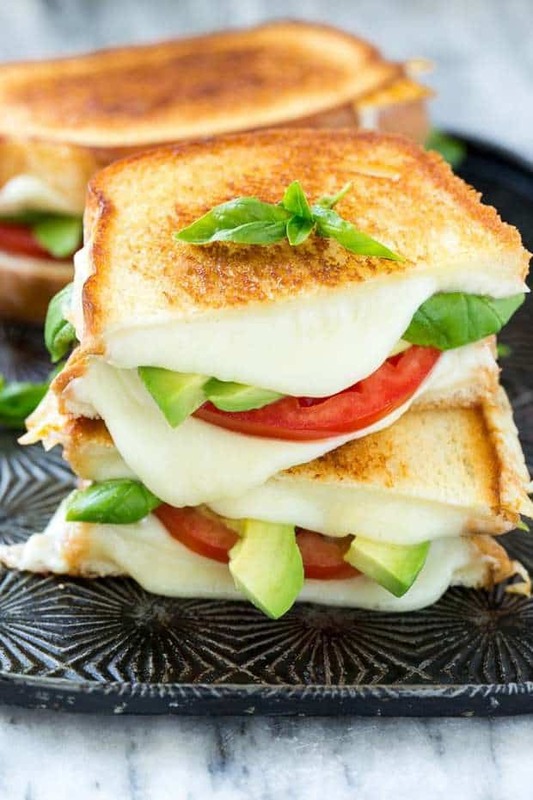 From Dinner at the Zoo :: Click HERE for the RECIPE Caprese Sandwich Recipe is the classic combination of tomatoes, mozzarella and basil with the welcome addition of avocado slices, all sandwiched together between slices of buttery toasted bread. 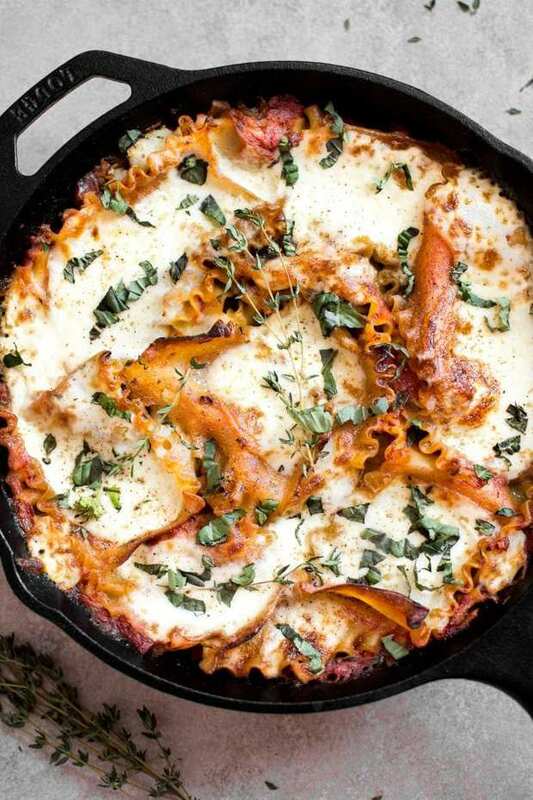 From Salt and Lavender :: Click HERE for the RECIPE This vegetarian caprese skillet lasagna recipe is a delicious lighter take on lasagna. It’s really easy and all cooked right in the skillet! From Seasonal Cravings :: Click HERE for the RECIPE This Five Ingredient Caprese Chicken is super fast and only uses pantry staples. It’s healthy, gluten-free and kid-friendly. 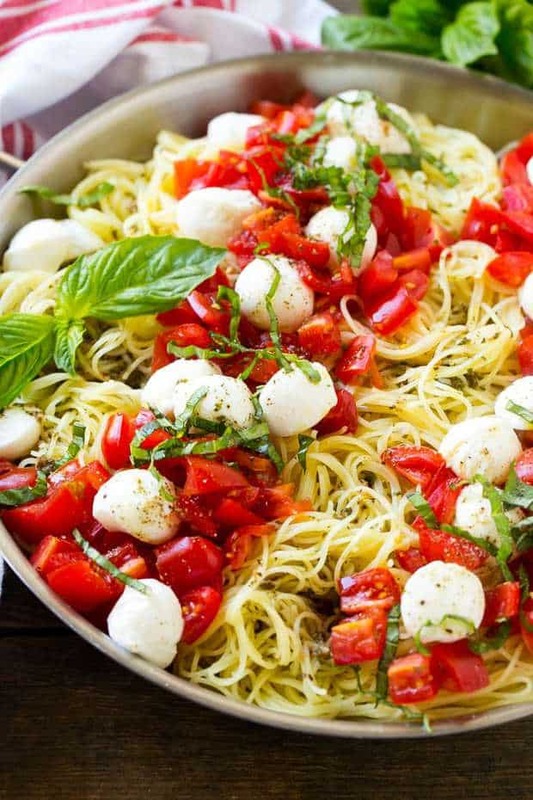 From Dinner at the Zoo :: Click HERE for the RECIPE Caprese Pasta with tomatoes, mozzarella and basil is the perfect speedy dinner – only a handful of ingredients and ready in 15 minutes! 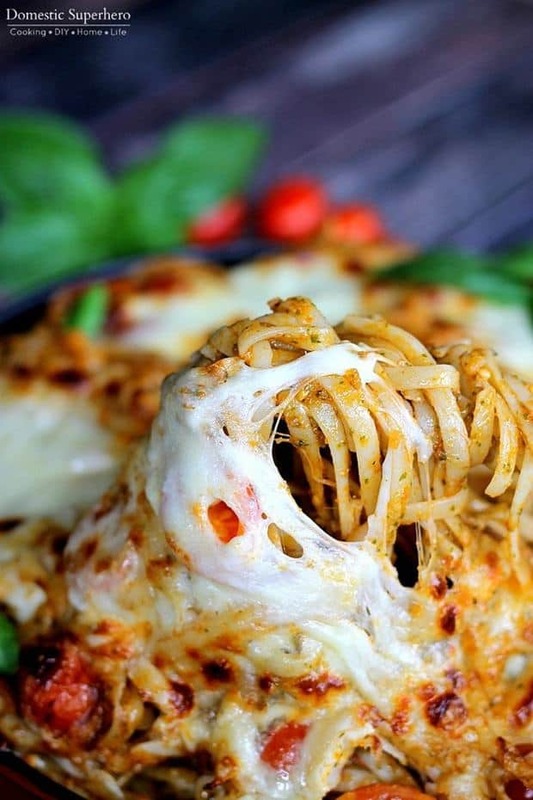 From Bitz N Giggles :: Click HERE for the RECIPE The fresh ingredients MAKE this pizza. 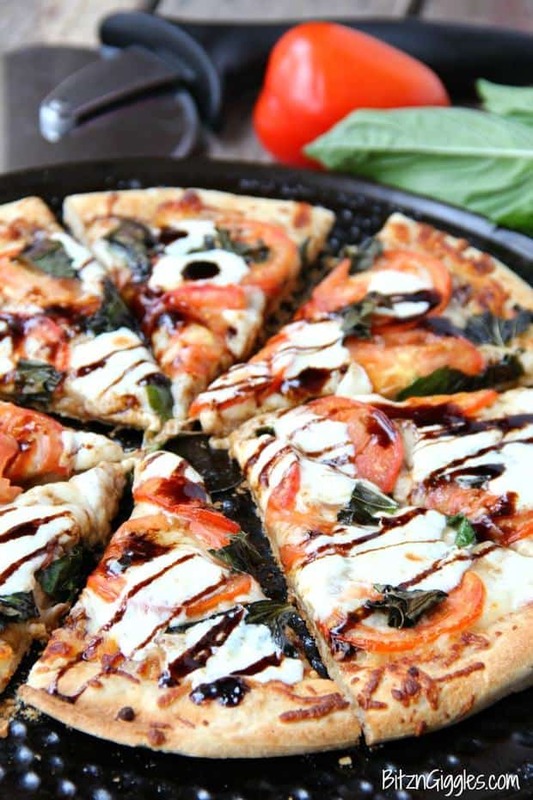 The balsamic glaze adds a little bit of sweetness, and the thin crust gives the pizza such a nice crunch. I’ve been known to make this pizza for lunch during the week when I’m pressed for time. Even though it uses fresh ingredients, the prep time is quick! 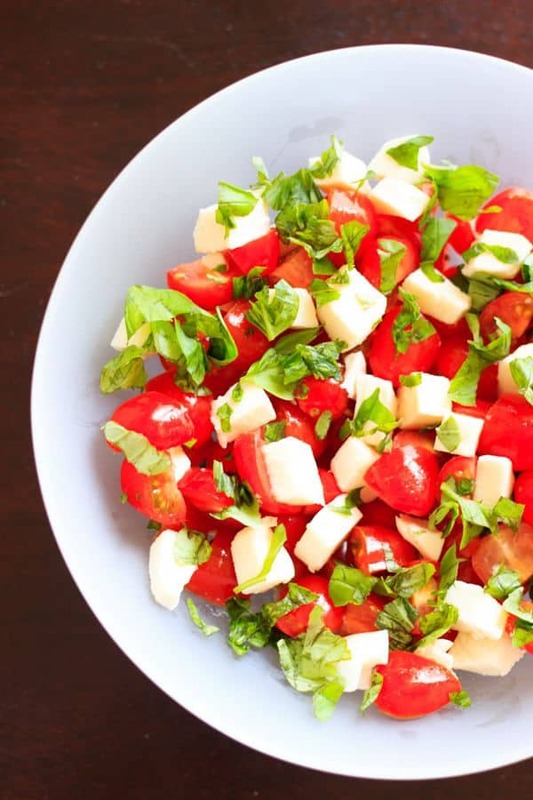 From Trial and Eater :: Click HERE for the RECIPE Chopped Caprese salad that takes 10 minutes and 5 ingredients to make. An easy way to enjoy this delicious gluten-free appetizer any time you want! This fresh salad will keep you coming back for more. 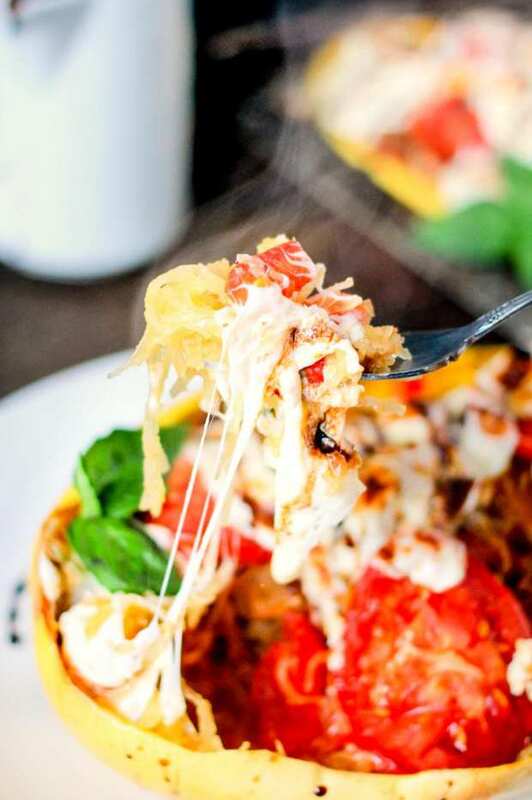 From Domestic Superhero :: Click HERE for the RECIPE Caprese Stuffed Spaghetti Squash is loaded with fresh mozzarella, tomatoes, basil, and then topped with a delicious balsamic glaze! Perfect healthy dinner! 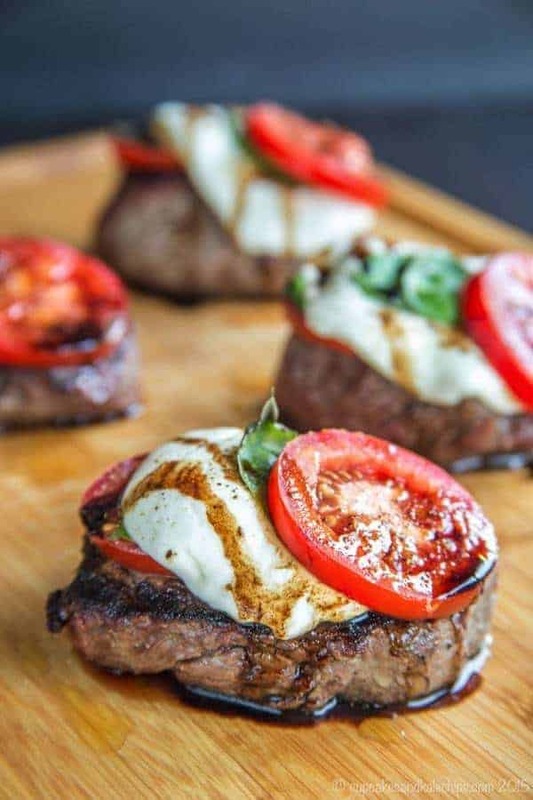 From Cupcakes and Kale Chips :: Click HERE for the RECIPE Caprese Grilled Filet Mignon is a simple way to dress up some amazing Certified Angus Beef brand filets with some of the freshest ingredients of summer. After simply seasoned with salt and pepper and grilling filet mignon, it is then topped with juicy tomatoes, fresh mozzarella, basil, and a balsamic reduction for an easy dinner recipe that is also a little extra special. This filet mignon recipe is not only delicious, it is also naturally gluten free and low carb. From Domestic Superhero : Click HERE for the RECIPE Caprese Stuffed Pull Apart Bread is fresh bread stuffed with delicious fresh tomatoes, basil, and mozzarella, then topped with a sweet and tangy balsamic glaze! 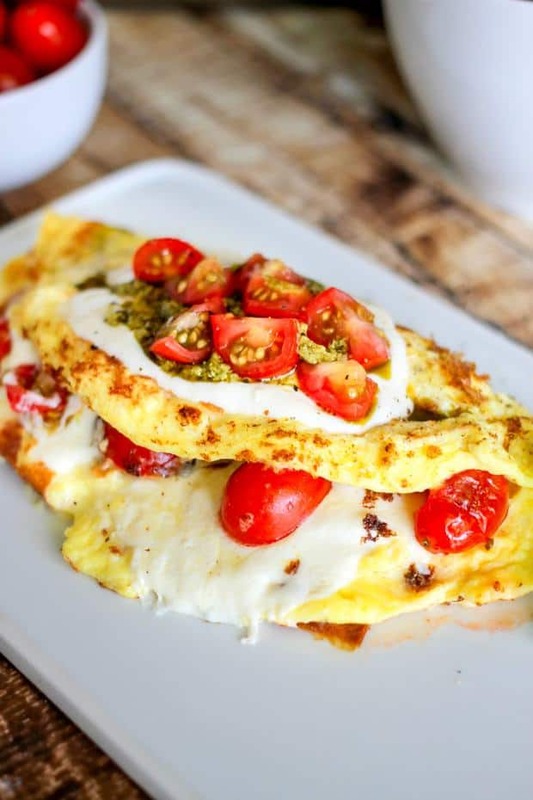 From Domestic Superhero :: Click HERE for the RECIPE Caprese Omelette is filled with balsamic drenched fresh tomatoes, basil pesto, and mozzarella cheese. Whip this up for the perfect breakfast or brunch. From Domestic Superhero :: Click HERE for the RECIPE Baked Caprese Pasta is full of fresh basil leaves, tomatoes, fresh mozzarella and more! It’s the perfect 20 minute meal! 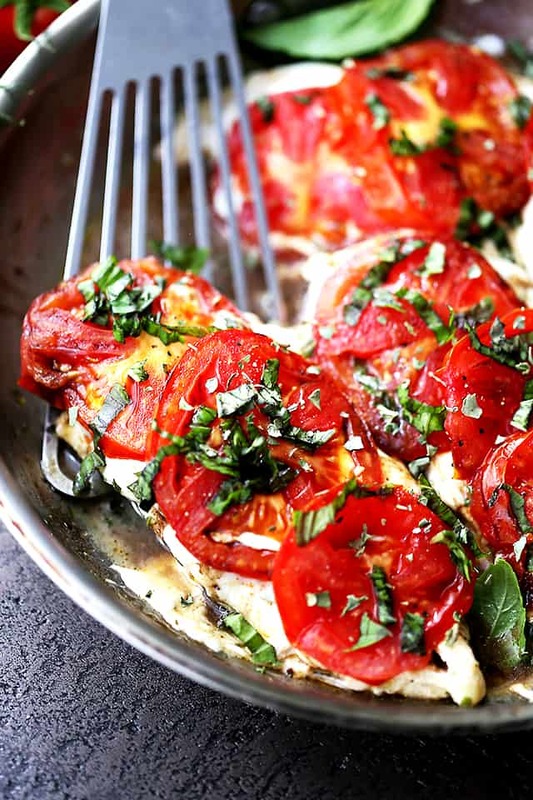 From The Blond Cook :: Click HERE for the RECIPE Attention all caprese lovers! 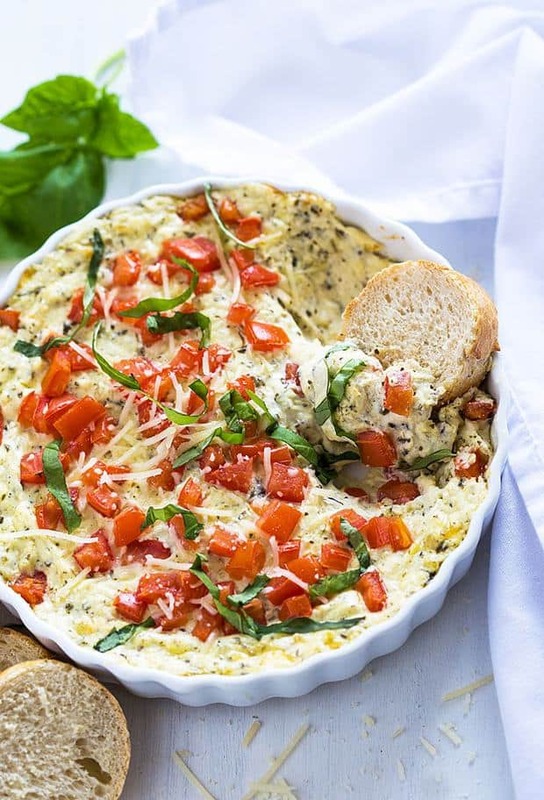 You’re going to absolutely LOVE this Hot Cheesy Caprese Dip! 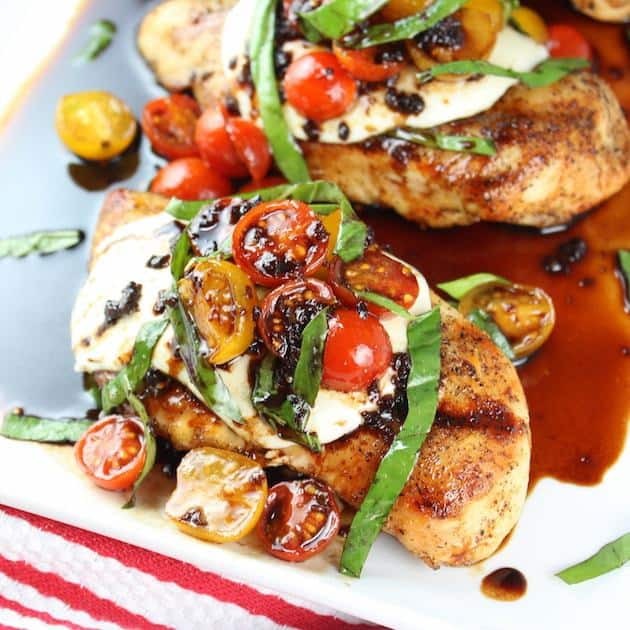 From Taste and See :: Click HERE for the RECIPE Grilled Chicken Caprese Recipe with Balsamic Sauce is so easy to make and so fresh and flavorful! The charred smoky flavor from grilling the chicken takes this classic flavor combo to a whole natha’ level! 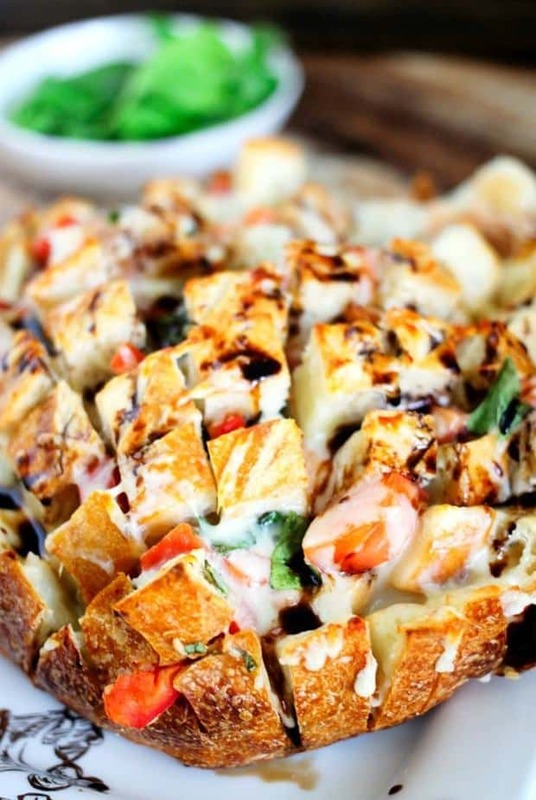 From Dinner at the Zoo :: Click HERE for the RECIPE The recipe for Caprese Bread is a rustic loaf topped with melted mozzarella cheese, ripe tomatoes, basil and balsamic glaze. The perfect summer dish! 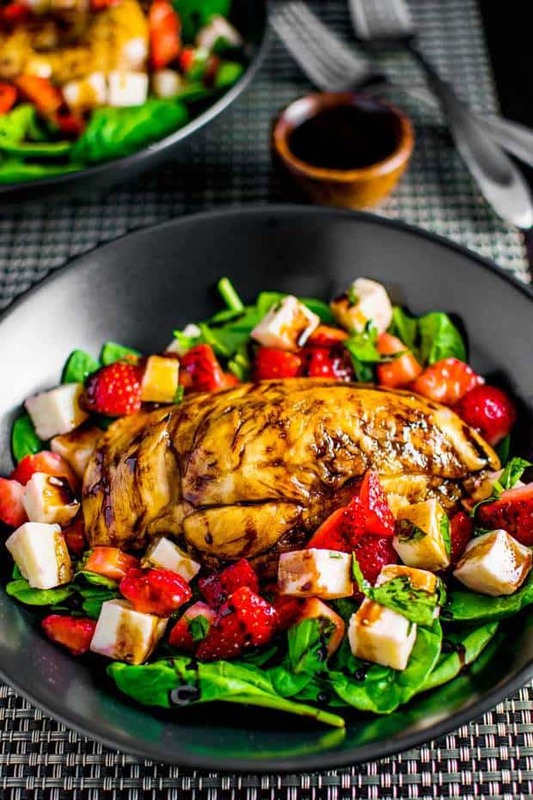 From Homemade Hooplah :: Click HERE for the RECIPE Liven up your salad routine with a strawberry caprese salad served with tender balsamic chicken, sweet fruit, and fresh mozzarella on a bed of baby spinach and drizzled with homemade balsamic glaze. 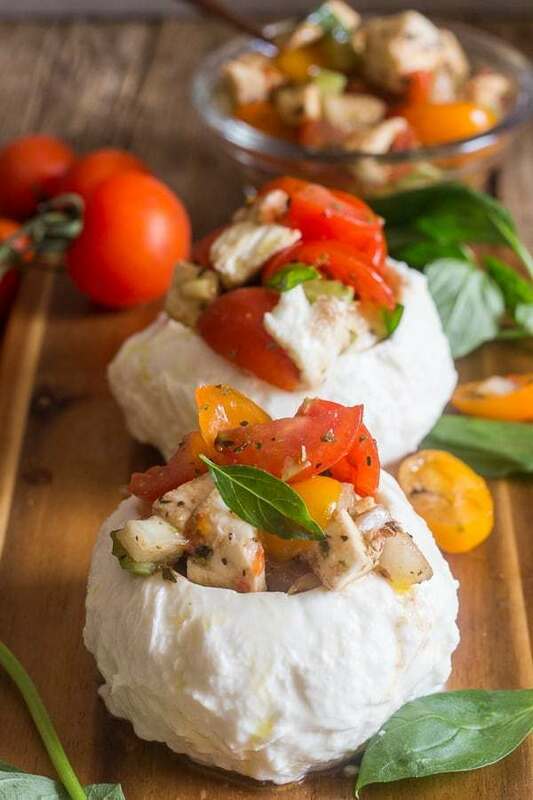 From An Italian in my Kitchen :: Click HERE for the RECIPE Easy Stuffed Fresh Mozzarella Caprese, the italian dish that screams summer, fresh mozzarella, tomatoes and herbs make this the perfect side dish, appetizer or even main course. You are going to love it. From House of Yumm :: Click HERE for the RECIPE Chicken Caprese Mac and Cheese. 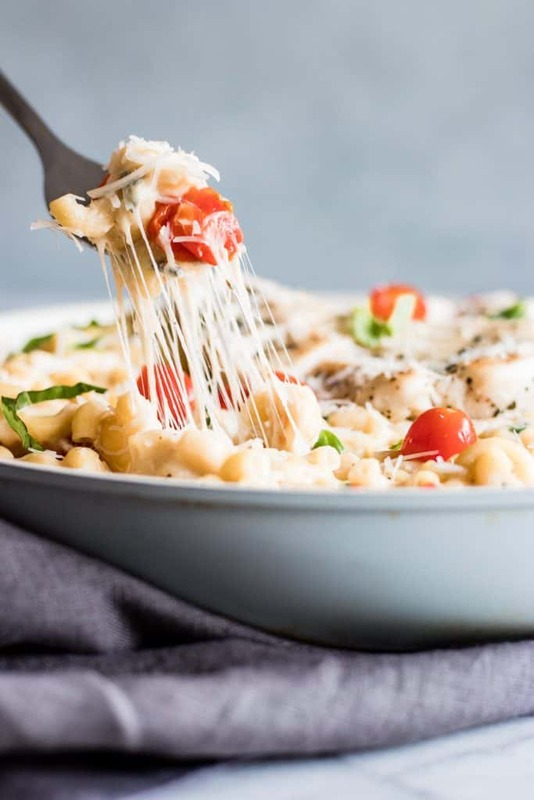 A quick and easy one pot creamy mac and cheese loaded with juicy chicken, fresh tomatoes and basil. 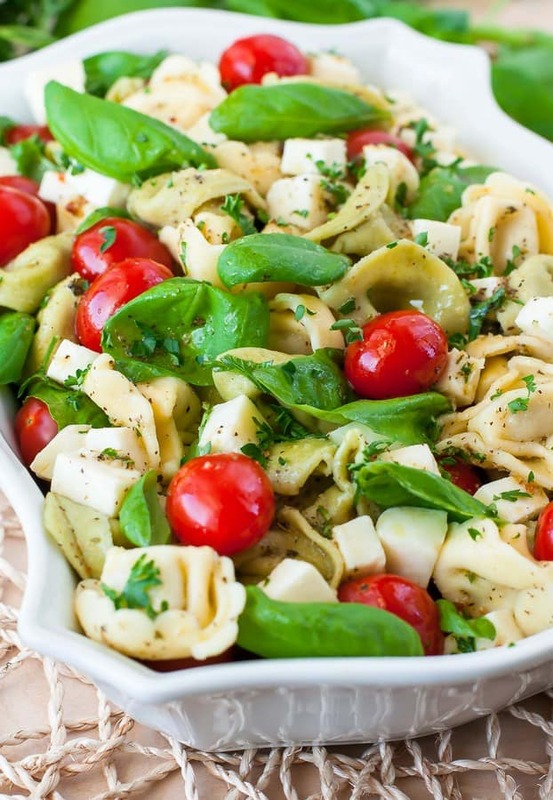 From Peas and Crayons :: Click HERE for the RECIPE This caprese tortellini pasta salad is ready to rock your next party or BBQ! Feel free to make this healthy pasta salad in advance – it’s great the next day! 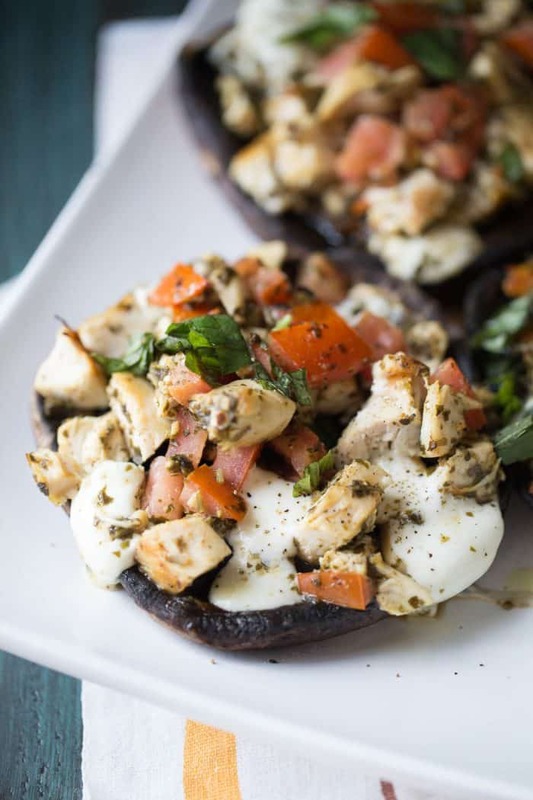 From Lemons for Lulu :: Click HERE for the RECIPE Caprese chicken-stuffed portobello mushrooms have lots fresh pesto coating each piece of chicken, the creamy mozzarella, and garden fresh tomatoes! 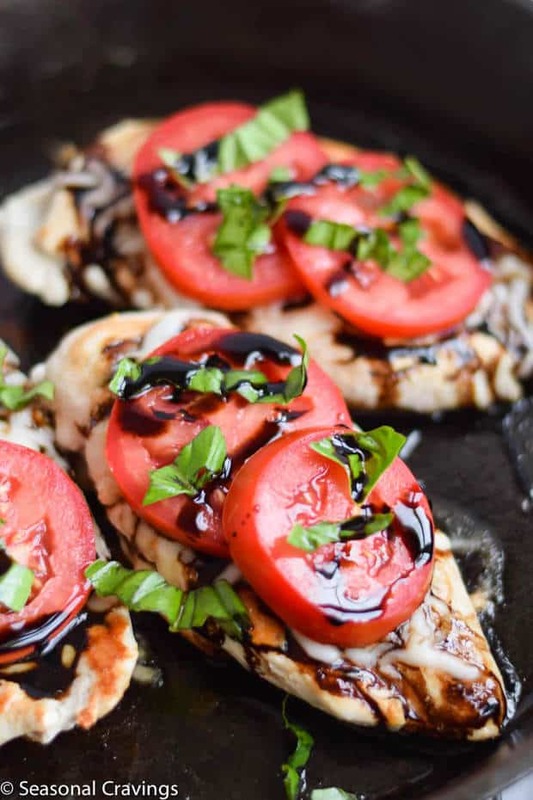 From Diethood :: Click HERE for the RECIPE Caprese Skillet Chicken Recipe – Pan-seared chicken topped with melting mozzarella cheese, fresh tomatoes, a sprinkle of basil, and a drizzle of balsamic vinegar. Quick, easy, and SO delicious!